My dad was a guerrilla gardener before it was hip. [Is it uncool to say hip? Is it uncool to say uncool?] If Johnny Appleseed was known for planting apple trees, then Freddy Daffodilbulb would be my dad's nickname. It's kind of unwieldy, though, so I'll stick with Dad. My dad has stealthily--or blatantly--planted daffodil bulbs from Delaware to Ohio. That's a pretty cool legacy. Nearly everything I know about gardening I've learned from my father. I suppose Mike McGrath's radio program You Bet Your Garden as well, but his kids can talk about their dad on their own blogs. I'm talking 'bout mine here. Just helping with chores as a kid, I absorbed many lessons, and watching him work on my gardens as an adult I came to understand what his actions mean. Always work to improve your soil. You think some bags of top soil are all you need to start a new garden bed? Think again! That bag of soil is like Wonderbread for your plants. Soil is alive, with all sorts of microorganisms and fungi which enrich your plants. That sterile bag of dirt is just dirt. Sure, it's still useful. Layer it on top of compost, shredded leaves [that one's all Mike McGrath], coffee grounds, sand, and urea. Over time, all of those nutrients will break down, making lovely soil. Don't stop now! Keep feeding your soil! As your garden grows, your plants will use the nutrients you've provided. 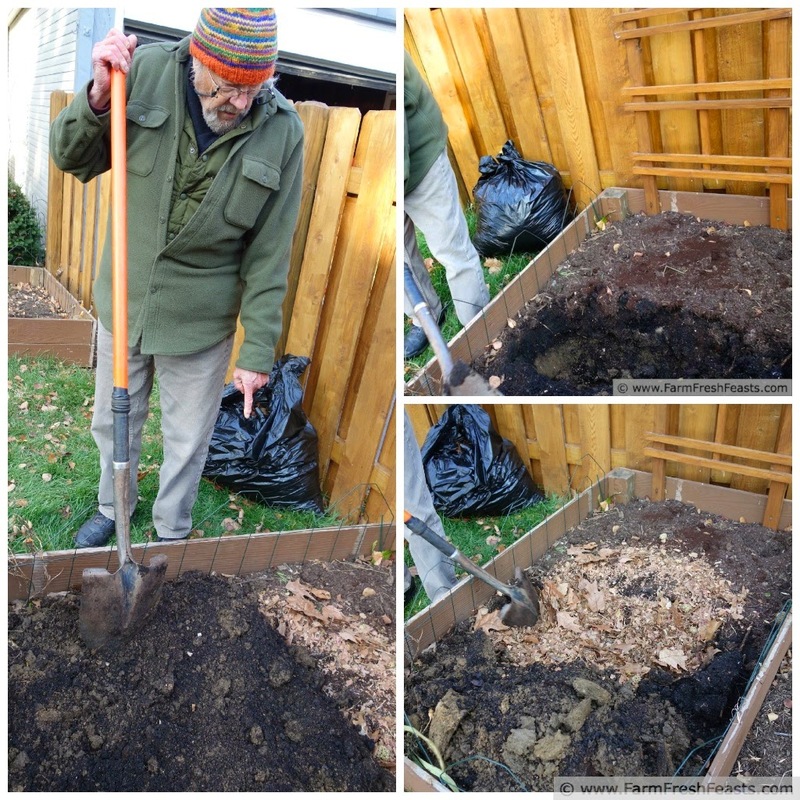 Adding more layers of compost around established plants and layers of shredded leaves/kitchen scraps/coffee grounds as you put your garden to bed in the fall will help the next season's plants. These amendments are practically free. This is frugal gardening. You don't need to buy fertilizer if you're constantly improving your soil. Spraying MiracleGro will cause a short-term boost for your plants, resulting in lots of new growth, but it's like a caffeinated energy drink. Once it's all used up, the now-larger plant crashes because it cannot sustain itself with the poor soil. Good soil, amended each year, will allow your plants to grow slowly and steadily. 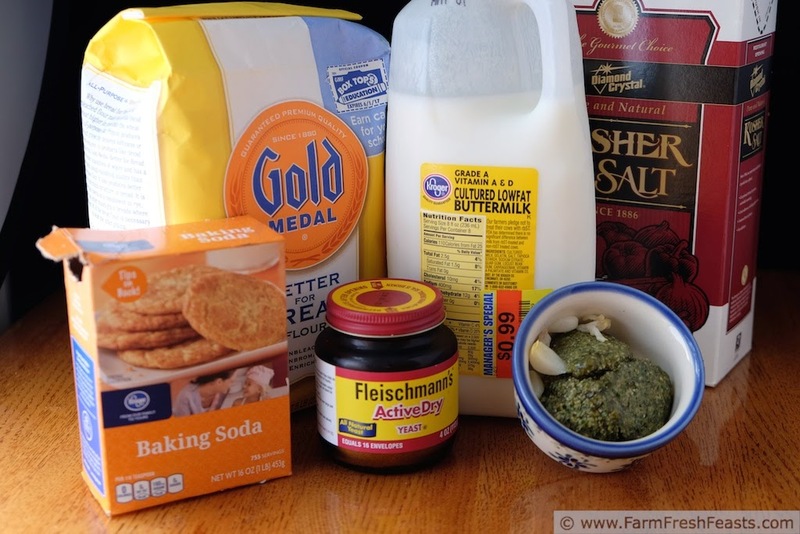 Now, this is a food blog so of course there's a recipe tie-in: Roasted Garlic & Pesto Buttermilk Pizza Dough. I make this using vegetables I've grown in my garden, in a single garden bed, so I want to walk you through a year in the life of one garden bed. In June, after I've harvested my garlic crop [wait, what?--don't worry, keep reading. If you don't have a garlic crop you just start with the empty garden bed] I layer shredded leaves, compost, coffee grounds and worm castings on top of the existing soil. My goal is to fill up to the rim of the box. [No worm castings? No problem! I've only had worms--in a bin in my son's closet, thanksforasking--for 2 years, and before that I just used the other amendments] then I get a bunch of basil plants and whatever pretty flowers (to look nice to the pollinators and to us) I can find on clearance and nestle them down into the bed. All summer long I water and harvest the basil, pinching off basil flower buds to encourage leaf production and removing spent flower buds to encourage more flowers to grow. My basil and flower bed is full of bees and butterflies, pollinating my nearby tomato, squash and pepper plants, so everybody is happy with this arrangement. If you can plant a daffodil, you can plant garlic. In Fall, some time between Canadian and American Thanksgiving (or whenever the first frost date approaches) I pull all of the plants. I make a mass quantity of pesto and put it up in the freezer [if I play my cards right, I'll use up the last of the pesto in early July]. Then I repeat my summer actions, with a twist. 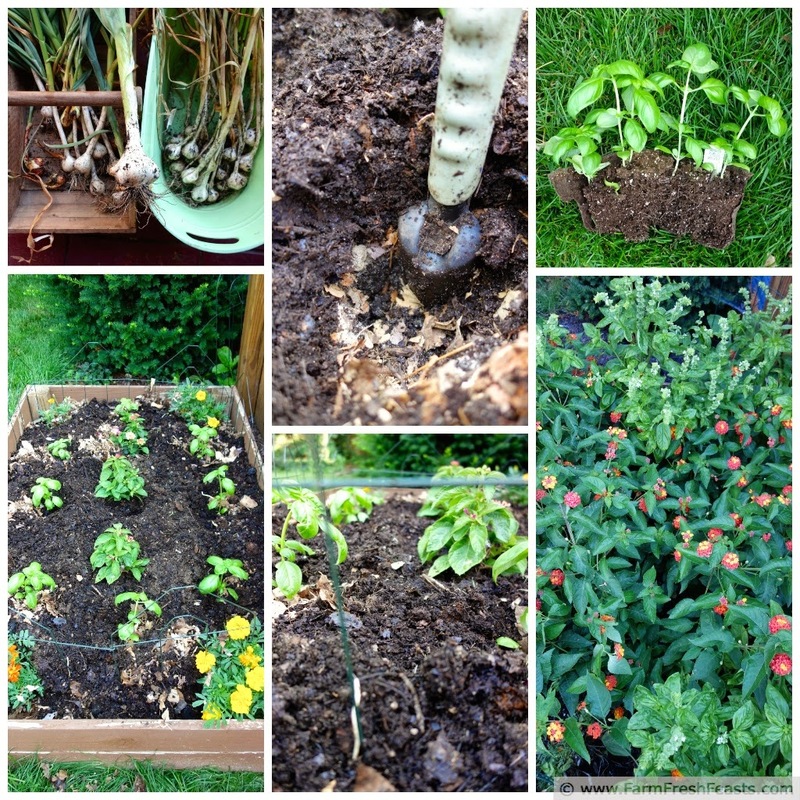 I'll layer kitchen scraps, shredded leaves, coffee grounds and compost--as well as worm castings if available--to fill up the raised bed. I'd selected/saved the largest garlic bulbs back in June, stored them in a cool dark dry place all summer--now they go into the bed. Use what garlic variety works best in your climate. I may water this bed a time or two, but I pretty much leave it alone. After all, those daffodil bulbs planted by Freddy Daffodilbulb aren't getting grow lights or anything and they do just fine. You may see growth before winter, you may not. It's all OK. In Spring the garlic will take off, and as summer approaches a lovely garlic scape will appear (on my hard neck garlic, soft neck varieties do not have this). Cut it off and cook with it--here's a round up of garlic scape recipes. When the garlic leaves start to brown and wither, pull your garlic plants up. Let the garlic dry for a couple of days, save out the largest bulbs for seed, and roast the rest. And that brings us back to dough. 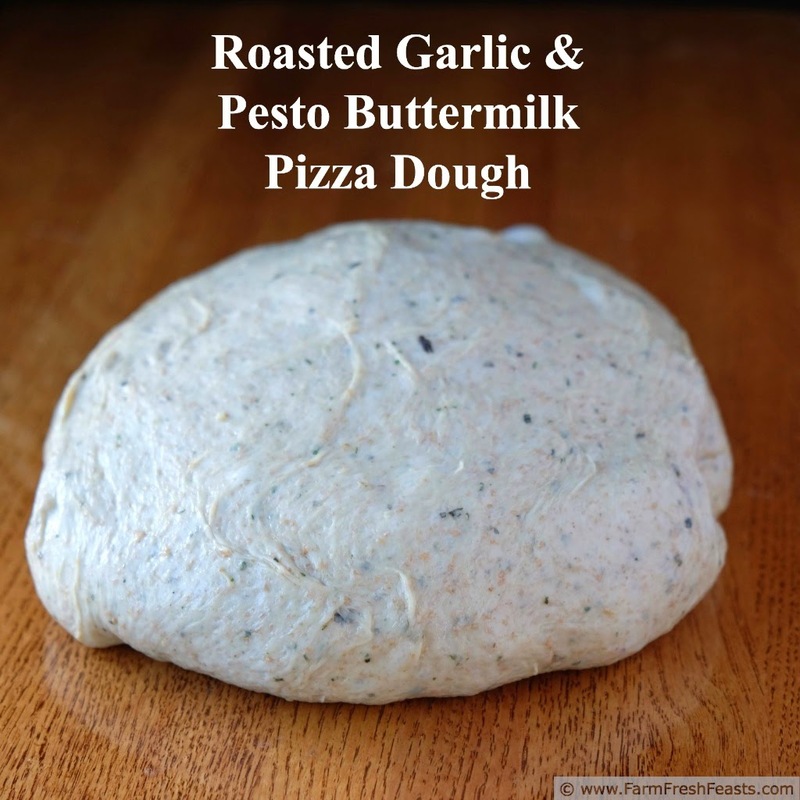 Since I've spent so much of this post talking about gardening, please refer to my Pizza Primer post for step by step directions and photo collages about turning those ingredients into a ball of dough. You can find the post here. **To every thing there is a season. Last weekend my brothers and I visited the house we grew up in. In the past 32 years since we moved away, the neighborhood trees have grown huge--but our old backyard no longer produces food for the family that lives there. 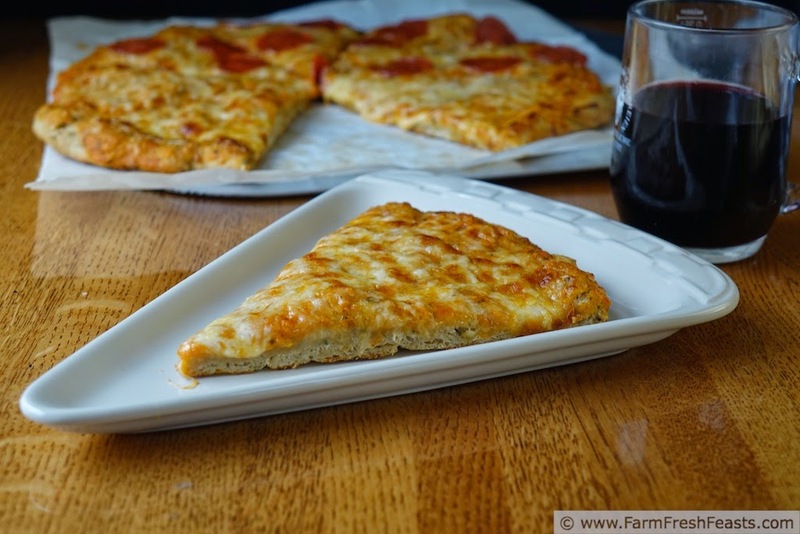 For more pizza dough recipes, and for pizza topping recipes--all broken down into categories like Vegetarian Pizzas and Savory Pizzas with Fruit, please see my Visual Pizza Recipe Index. For more recipes using garlic, please see my Garlic and Garlic Scapes Recipes Collection. For more recipes using herbs like basil, please see my Recipes Using Herbs Collection. These collections are part of the Visual Recipe Index by Ingredient, a resource for folks like me eating from the farm share, the farmer's market, the garden, the neighbor's garden, and great deals on ugly produce at the grocery store. I'm sharing more recipes on my Pinterest boards, follow me there. If you like a good peek behind the scenes like I do, follow me on Instagram. Need a good read? I'm sharing articles of interest on my Facebook page, follow me there. Want to know How to Use This Blog? My dad is definitely not a hipster, but it sounds like your friend utterly is. That's awesome! Thanks for your sweet words! Welcome welcome welcome Kirsten!! Wow... I learned so much from you today. I love this post. As a matter of fact, I'm printing it up so that I can take it to the cabin with me and re-read it this weekend, and then hand it over to my husband to read too! So very interesting. Thank you for sharing that! Can I get away to a cabin for the weekend, too? It sounds marvelous! I'm glad that this weekend kicks off summer (in that school is officially out) but I was away at my folks' last weekend so I'd better stick around with the family this weekend. Ah well--thanks! You obviously learned a lot of useful things from your father about gardening - including the understanding that if you feed and care for the soil, the rest takes care of itself. No need for expensive additions from the nursery. But I think the love of gardening and using space wisely is the most useful lesson of all. I think you nailed it with your last sentence. Want to be my editor? Wow, that is so cool! Your parents were on point. And, this pizza looks GOOD! I have been craving "real" pizza like a maniac lately - maybe sourdough is the way to go! I've got starter and have made some sourdough pizza doughs, but never blogged about them. Yet. Must get on that. Cravings are hard! Kirsten, this was a lovely, wonderfully thoughtful, and informative post. I really enjoyed reading it. Even though we don't have a garden at the moment (city apartment living), I loved learning about enriching the soil and tending to your plants. The pizza dough sounds fantastic too! My folks are moving into an apartment and it will be a change--not saving scraps for compost when the community garden plot is so far away--hmm, I wonder if a worm bin would interest them. My houseplants love the worm castings that I give them. It's totally cool to say hip because I say it and I'm obviously cool. I loved this post. THANK YOU! It was very helpful. I read it twice, slowly, and pinned it as well. Very helpful and I'll make sure to keep adding coffee grounds to the garden bed. The bulk of my soil was from a prior raised bed plus my own compost so I think I have a good foundation. Now I need to keep it that way. I looked at the photos of your garden and sat down to write this post with you in mind! Why did it not occur to me to pin a post about nurturing soil? Sheesh--food is on the brain.